The automobile plays an important role in the transport system of India. With increase in population and living standards, the vehicle population also increasing day by day. There is steep increase in the number of two wheelers during the last few years. All this are increasing exhaust pollution and particularly in metros as density of these vehicles is very high. As we know, more the emission, more the amount of fuel we have to burn in engine. Fuel consumption is directly depends on working conditions of an engine. Particularly for two wheelers, an extensive analysis of energy usage and pollution shows alternative power systems are still a long way behind the conventional ones. 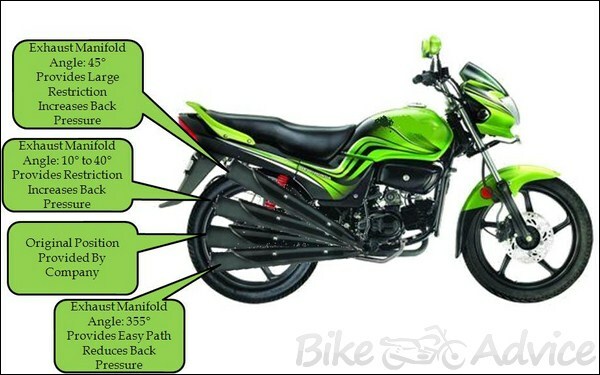 Moreover many bikers uses modification in their exhaust to get so called exhaust tune and sporty look. Here is the live example of it. 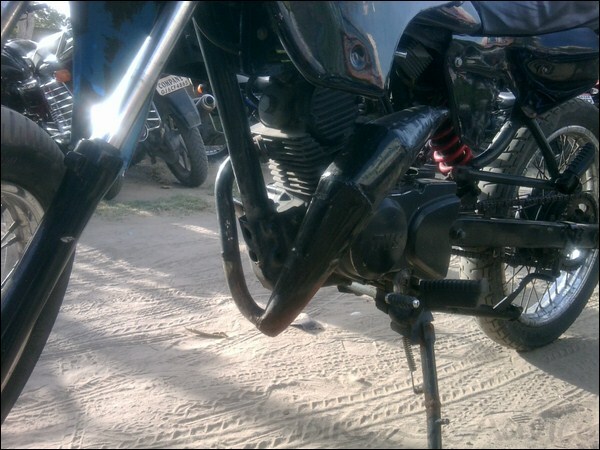 He has converted his normal TVS bike into dirt bike and exhaust has been modified to get sound like dirt bike. I saw many FZs, FAZERs and other bikes with modified exhaust like R1. Then I decided to observe the effects of this modification and I had performed one experiment. Engine does a process called scavenging in between completion of exhaust stroke and starting of suction stroke. This process is for removing the burned gases from the cylinder with the help of fresh charge. The scavenging efficiency of engine is directly affected by speed of the engine, exhaust valve opening, exhaust port dimensions, exhaust pipe location and position, dimensions of catalytic converter, muffler design. All these parameters finally affect the back pressure of exhaust. 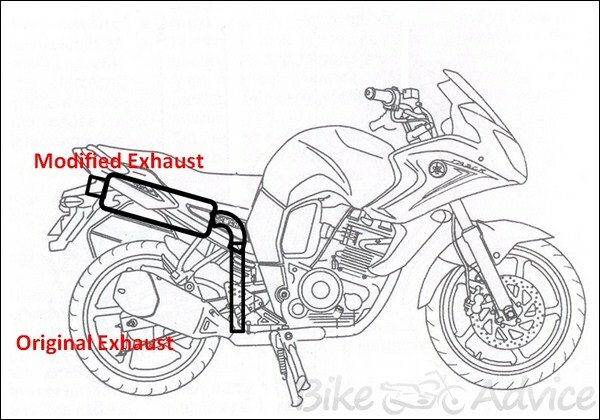 Back pressure in the exhaust is required to remove the gases from exhaust pipe. After completion of exhaust stroke, Pressure in the exhaust pipe becomes more than the atmospheric pressure. Because of this, gases flow automatically from pipe to the atmosphere with high velocity and produces tune that we listen from exhaust. As we are increasing the exhaust pipe length, we are introducing more bends in the exhaust pipe. Each bend causes flow restriction and friction losses in the gas flow. This leads to chocking of flow again. As this two major factors result in chocking of flow, the next batch of burned gases coming out from cylinder don’t find any way to move. Finally the scavenging efficiency of engine reduces drastically and burned gases remain in the cylinder. These burned gases got mix with the fresh charge and burnt again and again. This process leads to generation of more emission. So to check the above said effects of modification, I performed an experiment. The figure indicated here illustrates the HH PASSION just for outlining the set-up. In real experiment, I used other bike. I increased the slant of exhaust pipe up to 90°. Because this is the maximum angle likely to be exerted at the time of modification. 3000 to 5000 RPM was selected for the test because in usual driving practice this is the most common operating range. First, I measured the performance with original angle provided by the company to get the standard data. The next step was to carry out the performance test with various changed angles of exhaust opening. Changed exhaust manifold angles would result as higher fuel consumption, low brake thermal efficiency, and high exhaust emission. Below fig indicates my prediction I made before test and also illustrates the changing angle of exhaust. The above figures indicates the total experimental set-up used for the test. Now I directly switching over to result I got from this test. The value of back pressure for 90° is approximately 3.2 times more than the standard value. Back pressure value increases 0.08 KPa with increase in manifold angle by 1°. This nature of back pressure is applicable up to 60°. After 60°, the increase in back pressure turns out to be 0.44 KPa with 1° rise in manifold angle. Fuel Consumption increases 7.93 gm/hr with increase in manifold angle by 1°. Thermal efficiency of engine decreases 0.17 % with increase in manifold angle by 1°. HC emission increases 2.60 ppm with increase in manifold angle by 1°. CO emission increases 0.054 % with increase in manifold angle by 1°. So guys, here you have the results of modification done in exhaust. I did the modification only with opening angle of exhaust; many other factors are yet remaining to be examined. Many other factors also contribute to these effects. You can judge the results what if all the factors contribute together. This is what generally happens when we modify our exhaust with local dealers or garages. We blindly are increasing pollution and fuel consumption of our bikes. Many calculators are available on net for calculating correct required back pressure for your bike engine. You have to insert some technical specifications and it will provide you the correct back pressure. I personally suggest you not to modify your exhaust ever. Because it is optimum design provided by the manufacturer and designed by their best designers. Even then if you are so passionate about noisy bikes (there is vast difference in tune and noise), first you get the calculated back pressure and then get the correct dealer for correct exhaust.